Camp Doran was located 5 miles east of Custer on S.D. Highway 36 (16A). As a tent camp in 1933 it was located at a spot now covered by Stockade Lake. When a permanent camp was built, a location was selected just below the dam site on French Creek. It was sheltered from the north winds by a rock cliff through which the spillway was blasted. The camp site was small but flat, and provided space for a compact camp (1934). The original buildings included eight 50x20-ft barracks, a bath house, mess hall and kitchen, supply room and root cellar, a large recreation hall, general office and hospital, and officers' quarters. A good water system and an electric light plant were installed (1934). Another barracks was added in 1934 (1935). Company 1795 was organized June 17, 1933, by officers of the 4th Cavalry at Fort Meade and arrived at Camp Doran as 44 men. It was brought to full strength of 200 men by drafting alphabetically a certain percent of each company in the South Dakota district - one man whose name began with A, one with B, and so on until each camp had contributed its required percentage (1934). The first few days after arrival were spent in laying out camp, setting up kitchens, and pitching tents. As Camp Doran was sub district headquarters camp, the sub district commander was stationed there. The camp surgeon was sub district surgeon, and the sub district chaplain also had quarters there (1934). After it was decided to continue the emergency conservation work program (ECW) for a second 6-month-period, a winter camp had to be selected and construction started. Because Doran Lake, when completed, would cover the area occupied by the summer tent camp, the company commander and camp superintendent selected a site on the lower side of the dam on the banks of French Creek. 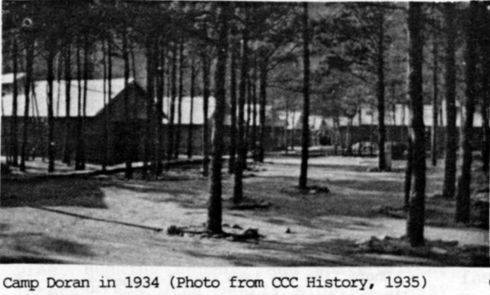 While the new camp site did not include very many acres of flat, level ground, it was possible to build a camp with more than adequate accessibility to all buildings in one of the most compact of CCC camps (1934). In honor of the camp doctor, the side camp established to saw lumber for the winter quarters was named Camp Bartholomew. The company commander spent every hour his official duties could spare in working with the men devising ways to make the quarters more comfortable and the general appearance of the camp more pleasing. He seemed untiring in his efforts to build a camp which would be equipped with every home convenience that conditions and finances would permit, knowing that he would not be able to enjoy the benefits of his labor. He would be called back to more important duties awaiting him with his organization at Fort Meade, the 4th Cavalry Regiment (1934). Buildings were erected by local carpenters with the material cut and sawed by CCs from timber 18 miles west of Custer, where the fly camp was established. They cut 189,000 ft of lumber in 19 working days--a record for a small portable mill in the Black Hills. The lumber was hauled by truck 23 miles to the camp, and 6 weeks from the time ground was broken camp was practically complete (1934). By October 1 Company 1795 was moved into new quarters. 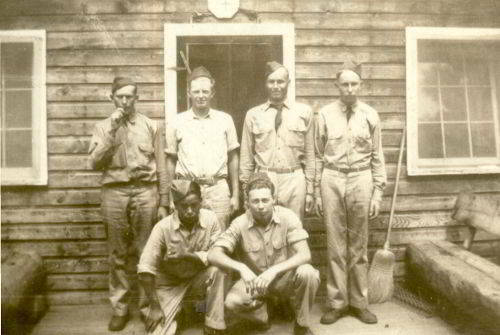 Because their quarters was the last building to be started, the national park service staff and the army officers remained in tents until about the middle of the month (1934). During the first 6 months the attitude of the CCs changed. When they carne to camp they were strangers to each other and to the country. They were not sure that they would care for either the work or the army discipline. One of the boys stated he would not like the proposition even if it was good; he was simply driven to come to camp as he had no place to go and had to eat. Some of the men were very homesick, some did not know how to work, and others had ideas which were not conducive to their welfare nor to the welfare of the camp. They were suspicious of the army officers and of the foremen. The regularity of the work, meals, etc. was rather monotonous at first, and all in all, for the first month nobody liked either the camp life or the work (1934). Morale began to rise, and it was not long until practically all began to take an interest in the work. The men began to find that the army officers, superintendent, and foremen were not so bad; no one was going to put "anything over" on them, and everyone was just trying to do his job the best he could (1934). The men learned that everyone could be comfortable, even in a camp, and that quarters must be kept clean and that meals must be on time; in fact, they found that a regular system of living was not so bad after all, and when the time came to re-enroll practically all were ready and anxious to sign up for another 6-month period (1934). They did not re-enroll because they had no other place to go, but because they liked the place, the work, and the conditions under which they were living. They were really not the same men who came to the camp--they were new men with something to look forward to (1934). They wanted to finish the job; they were interested in seeing the completion of the work they had started; they had moved the first dirt for the dam; they had cut the brush on the dam site; they had cut the timber which went into the building of the camp--not just a hole to crawl into. They were proud of the fact that they had accomplished something worthwhile, and there was no doubt but what this had been worth more to them than any other similar length of time spent at any other pursuits (1934). It was also a fact that their health was much better than when they enrolled. All in all, they were much better citizens in every way than when they came to camp (1934). A number of improvements were made in the camp buildings in 1934. Most noticeable was the new officers' quarters to replace the one which was destroyed by fire in August. In addition, a new barracks was built to house extra enrollees brought in during the summer and fall, making a total of nine barracks. A ceiling was added to the mess hall to prepare it for winter, and entryways put over the entrances. The barracks were reinforced and roomy lockers built (1935). Public Domain This work is in the public domain and is free of copyright restrictions. 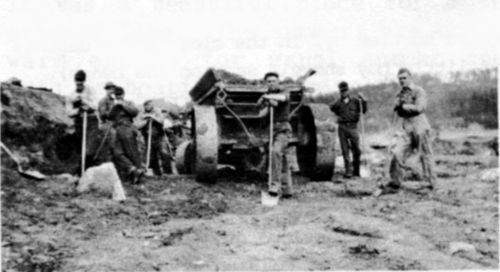 Work started on the clearing of the dam site and the lake bed on July 5, 1933. The clearing was completed by August 1, the borrow pit was laid out and the dam itself under construction by July 24 (1934). Doran Lake (later named Stockade Lake) dam, the dream of many local people, was on its way to completion (1934). It took about 6 weeks to get the men interested in the work. Then they realized that they were not just shoveling dirt into a wagon, an everlasting job, but were actually building a beautiful lake for the people of the country for all time (1934). The dam was built of earth with a reinforced key wall the entire length anchored to bedrock. The quantities of materials in the dam were 80,000 cu yd earth, 400 cu yd reinforced concrete, and 1,500 cu yd of rock rip rap. The spillway was through a solid rock wall and the excavation quantities were 2,000 cu yd of solid rock and 1,000 cu yd of earth. The lake covered an area of 108 acres and had a shoreline of about 5 miles, with a capacity of about 2500 acre ft of water (1934). The County Chronicle reported that the outlet tube was closed and the lake started to fill April 27, 1934. After the dam was completed, a shoreline drive was built around lake. A 1500 ft beach with log pier and parking facilities was constructed on the east side. On the south side a picnic area and camp ground were developed with parking areas, tables, benches, outdoor stoves and fireplaces, shelters, and toilet facilities. 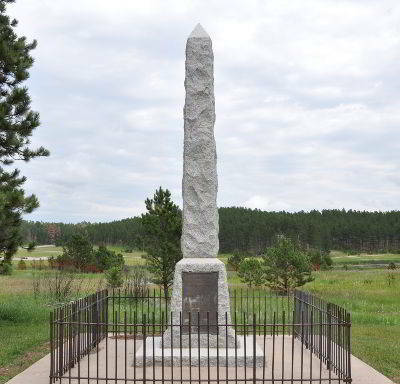 On the west side was the historic stockade for which the lake was and Tallent Monument, commemorating Annie Tallent, the first white woman to enter the Black Hills. Plans in 1937 called for a bathhouse on the beach and additional camping and picnic areas on the north shore (BHE). A new rock concrete spillway was installed in 1938 by CCs from Camp Lodge (CSP-38). Aside from the dam and the recreational area around it, three camps were in operation so that could be done in a larger geographical area (1935). 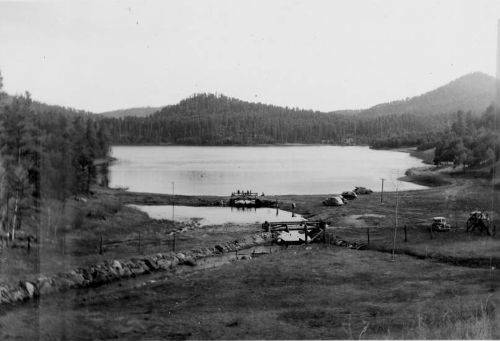 Small dams and trails were built from side camps at Sylvan Lake and Needles Highway and another camp was operated at Ditch Creek (CSP-38).